We’d love your help. Let us know what’s wrong with this preview of The Shadowed Onyx by Nicole O'Dell. Join dejected seventeen-year-old Joy Christianson on her journey to hope and healing as she leaves a dark world behind and moves into Diamond Estates, a home for troubled teens. This brand-new novel for teen girls will not only entertain, but also promises to capture your heart and challenge your faith. To ask other readers questions about The Shadowed Onyx, please sign up. "You Should Totally Read This YA Book!" The book was a awesome book. and i really learned a lot from it. Remember there is always a bad wolf and a good wolf. who wins ? The one you feed. Before i read this book i was feeding the bad wold kind of with depression. But now i am completely back to serving God i am feeding the good wolf with joy and happiness and peace. YA book. Good / God wins in the end, but I felt uncomfortably marinated in the evil up til the final battle. Joy learns there is no harmless inquiry into the spiritual world...not sure I feel comfortable walking with her through her mistakes. Joy Christianson lives in the sleepy Nebraska town of Ogallala. Last week, Joy went to visit her best friend, Melanie, and instead found her body. She had committed suicide, and now Joy wants to know why (and, really, who can blame her?). Joy has also had to deal with breaking up with Austin, her friend since childhood and boyfriend for the last year. Joy has also lost her faith, although her Down syndrome cousin, Beatrice, tries to remind her about right and wrong in her own innocent way. Now J Joy Christianson lives in the sleepy Nebraska town of Ogallala. Last week, Joy went to visit her best friend, Melanie, and instead found her body. She had committed suicide, and now Joy wants to know why (and, really, who can blame her?). Joy has also had to deal with breaking up with Austin, her friend since childhood and boyfriend for the last year. Joy has also lost her faith, although her Down syndrome cousin, Beatrice, tries to remind her about right and wrong in her own innocent way. Now Joy has befriended Raven, one of the bad girls in school, because she wants to distance herself from Melanie and Austin’s friends. First up, I have to say that the opinions expressed in this review are that of the parent, not the Young Adult audience that The Shadowed Onyx is aimed at. I was one of those teens who was hypothetically interested in the spirit world, but who always knew (despite not having a Christian upbringing) that messing with things like Ouija boards was not a good idea. Either they knew fake (and therefore a total waste of time) or they were real, and therefore not something we should be messing around with. As an adult, I can soon see that Joy is suffering from case of survivor's guilt (but to tell you why might spoil the plot). I don't know if a teen would see this underlying issue, or if it would just go over their head. The story is all written in the third person, from Joy's viewpoint. The narrative does seem a bit juvenile, but that could just be the adult me talking. Teenagers are fascinated with the concept of the spirit world, and The Shadowed Onyx is a solid Christian response (although it got uncomfortably close to crossing the line at some points). The author writes with a sense of authority around the spiritual content, while at the same time, she has captured the uncertainty of youth without being moody or melodramatic. The Diamond Estates series is based on her experiences as a resident at Teen Challenge as a teenager, and this experience comes through in the writing. It shows there is power in the language we use. 'Spiritual' sounds so much better than 'satanist', and 'contact' less scary than 'haunt'. But I have two concerns with The Shadowed Onyx. First, parts of the story skate very close to the line, and could almost be seen as a 'how-to' manual. More worrying, a very innocent or undiscerning teenager might not see that this is written from a Christian worldview, and might be encouraged to take the same path as Joy--and for the first half of the novel, Joy's thoughts and actions are quite anti-Christian. And the story is told exclusively from Joy's viewpoint, so there is no indication that she is being lied to and that her actions are wrong. "She wasn’t afraid of the dark anymore; in fact, she preferred it. Light was unnecessary because it only revealed half the picture, if that. It crowded out the truth rather than illuminating it." In reading this, it's quite easy to see how a vulnerable teen can be seduced by the power of the dark side, and how well it masquerades as light. As with all the most convincing lies, it is based on the truth. This is a very good novel, and one that many parents of teens would benefit from reading, but it is a story I would recommend to others with caution. Although it is the third book in the series, it is a stand-alone story. This is the third book in Nicole O’Dell’s Diamond Estates series from Barbour Publishing. And is set during the Sevententh year of Joy Christianson’s life. While doing fine in high school, succeeding in sports, and being active in her church; her world and faith are rocked when Joy finds her best friend after she committed suicide. Suddenly Joy has faded, and starts trying to find answers. Enter some very helpful, not on the right track, teens that tell her they have answers and introduce her ‘innocently’ enough to a Ouija board. After feeling the power there, and knowing in her heart it is wrong. Joy continues to explore witchcraft all in the name of finding ‘real’ answers. In the end she finds that it wasn’t worth it, and she wants her faith in Jesus back. But now she is stuck, and can’t get out. I loved the other two books in Nicole O’Dell’s Diamond Estates series—I will try to review them soon—but this one was simply my favorite. I can’t exactly describe it; the storyline and characters were written so amazing. One thing I can say about this book is it is definitely written for an outreach—no girl, after reading this, will ever be tempted to get into witchcraft. Nicole O’Dell portrays the whole ordeal in perfect matter; she writes fiction with such a real feel, the feeling that this st I loved the other two books in Nicole O’Dell’s Diamond Estates series—I will try to review them soon—but this one was simply my favorite. I can’t exactly describe it; the storyline and characters were written so amazing. One thing I can say about this book is it is definitely written for an outreach—no girl, after reading this, will ever be tempted to get into witchcraft. Nicole O’Dell portrays the whole ordeal in perfect matter; she writes fiction with such a real feel, the feeling that this stuff is true, and that it’s awful. On a different note, I love, love, loved the Christian outreach written in as well, the themes that eventually save our main character from destruction. I wanted to just cheer for Joy in her moment of revelation! The storyline goes as follows. Joy is a seventeen-year-old whose best friend Melanie just committed suicide after an ordeal including Joy’s boyfriend. In trying to find the truth, Joy thinks that maybe if she turns to the spiritual world, she will find answers. She is granted a spirit guardian who at first she loves to no end. As times passes, she starts to realize her “guardian” hates prayer and any mention of God and Jesus, to the point where she becomes afraid of it. Even when she is granted passage to Diamond Estates, she still lives in fear of what her “guardian” will think if she decides to pray to Jesus. She wants to turn back to the truth, but when it comes down to it, is terrified of what her “guardian” will do to her if she does. One thing I love about Nicole O’Dell’s books is, while they deal with deep and mature content, they always stay appropriate and non-violent. I loved all of her books, but this one was just written incredulously and made me sad, mad, and happy all at the same time: sad for Joy and her loss of her best friend; mad at Joy for her decision to turn to witchcraft; and happy that this is not my world, nor any of my friends or families’ worlds. I would recommend reading this series in order, with this being the third book, but realistically, it doesn’t truly matter. This book was simply amazing: harsh with reality, gentle with truth, and overall such strong Christian themes that you can’t—and shouldn’t—ignore. I would give this book 10 stars if I could and would recommend it to ages 12 and over. Teenager Joy Christianson always was the life of the party, but all that changed when her best friend committed suicide. Now all Joy wants is to reconnect with Melanie. She wants to know WHY. She needs closure. When some of her new friends tell her how she can find these answers using a Ouija board, Joy is torn between thinking it’s a game and being creeped out, but she can’t resist the lure. She slips deeper into the occult as she seeks meaning in her life. The old answers from her parents and h Teenager Joy Christianson always was the life of the party, but all that changed when her best friend committed suicide. Now all Joy wants is to reconnect with Melanie. She wants to know WHY. She needs closure. When some of her new friends tell her how she can find these answers using a Ouija board, Joy is torn between thinking it’s a game and being creeped out, but she can’t resist the lure. She slips deeper into the occult as she seeks meaning in her life. The old answers from her parents and her church don’t seem sufficient any more. As depression and oppression take hold, any sort of meaning slides further and further away. But all hope is not lost. What will it take to jolt Joy into a new path, one where she genuinely seeks help? Even a trip to Diamond Estates, a home for troubled girls, is not an easy cure. But with God–and people praying–there is still hope. The Shadowed Onyx is the third (and final) book in The Diamond Estate series for teen girls. Each story features a girl who’s lost her way and seeks help in regaining her faith. These are not simplistic stories where, once you pray, everything becomes all better. Life isn’t usually like that. Our struggles are real. However, there is always hope, and each of these books also provides that in abundance. All three of these books are highly recommended for the teen girls in your life–girls who know that life is complicated and often difficult, girls who are facing huge challenges, girls who need a road map through their trials to hope. The Wishing Pearl deals with drinking and driving and abuse. The Embittered Ruby is about teen pregnancy, gang activity, and manipulation. The Shadowed Onyx, as mentioned, takes a hard look at the occult. These stories do not glorify the negative lifestyles, but use them as a backdrop to paint hope in bright colors. The Shadow Onyx follows Joy, whose life unravels after she finds her best friend's body (her best friend committed suicide). She gets deeper and deeper into the occult (although she calls it spiritualism) when she's convinced that Melanie (her best friend) was speaking to her from the dead. But, while it's easy to get drawn into the occult, it's not so easy to get away. Joy is "given" a spiritual guide, a wolf called Silas. He hurts those that believe Christ, he demands all her loyalty and he does his best to keep her away. Towards the end of the book, one of Joy's biggest hurdles in leaving the occult isn't because she's found peace, but because she's too afraid of Silas. And this danger of the occult is ever-present in the book. There are numerous incidents that show how dangerous it is. Objects are ripped, people are hurt. And about halfway through the book, Joy is given spiritual sight. She can see how monstrous these spirits are. She can see the battles being fought for our souls. That, I think, is the most powerful part of the book. It has managed to take the battle in the spiritual realm and translate it into words. And while it's shown that Jesus has the ultimate power over all things, material and immaterial, the power of the devil is not minimised. While we are conquerors in Christ, we must not underestimate the power of the devil to intimidate and scare us. In conclusion, this is a gripping book that vividly shows the dangers of dabbling in the occult. It's definitely a must-read. Reading The Shadowed Onyx has made me glad that I went back and brought Books #1 and #2 as if they are anything as good as this one then I am certainly in for a treat of a time as The Shadowed Onyx really made me think about how easy it is to be influenced by the outside world and backslide from Christ , Church etc especially if something terrible has happened in your life and you are searching for the answers on why it happened and how it happened. In The Shadowed Onyx, we meet 17yr old Joy who Reading The Shadowed Onyx has made me glad that I went back and brought Books #1 and #2 as if they are anything as good as this one then I am certainly in for a treat of a time as The Shadowed Onyx really made me think about how easy it is to be influenced by the outside world and backslide from Christ , Church etc especially if something terrible has happened in your life and you are searching for the answers on why it happened and how it happened. In The Shadowed Onyx, we meet 17yr old Joy whose anything but her namesake now as her best friend Melanie has just committed suicide and unfortunately Joy was the one to find her dead body. Eager for answers and a way to find out what really is going on , Joy turns to a group of newfound friends who are into Seances and Spiritual guides. All the things that Joy has been taught was wrong towards God. As Joy becomes more heavily involved, she takes things to a next level recieving her own spirtual creature - Silas ( a wolf) and an Onyx necklance which is said to contain her spiritual guidance. As the story goes along though, strange things start occuring and Joy as she starts to realise that maybe God isn;t that bad after all - she starts to find herself under attack. Is the Devil real and does he want too make sure she never goes over to the light? With the help of Ben and Gilly at Diamond Estates will Joy be able to save her soul and turn back to the way of the truth and light and steer far away from evil or will it harm her before she gets a chance to change and confess that she wants to follow God? When 17 year old Joy Christianson's BFF Melanie commits suicide, Joy's life spirals out of control. When Joy is betrayed by her best friend and her boyfriend, she is hurt. But a life-long friendship is worth more than a boyfriend, so hours later Joy seeks out Melanie only to discover her friend has ended her life because of remorse. As Joy struggles to come to terms with Melanie's death she begins dabbling various aspects of occultism and witchcraft. As Joy goes against her beliefs in her attempts to contact Melanie her friends and family are left wondering what happened to the once happy joyful young woman. But as Joy goes further into the spiritual as searches for peace she takes a spirit guide who may cost her her very soul and lead her down the same path as Melanie. Diamond Estates is Joy's last hope but only is she can admit the danger she is in and will call upon the Lord. Whenever Joy tries to turn from the path she is on something happens that convinces her that she will never escape. Death is following her every move, can she embrace the gift of eternal life that is before her? The Shadowed Onyx deals with the issue of suicide in a thoughtful way and it looks at the ramifications on those that are left to deal with the loss. This title also looks at the powerful draw Satanic worship has on those who are searching for answers. But most important is the power of the cross and sincere heartfelt prayer of both the seeker and the believer. The Shadowed Onyx would be an excellent addition to any library and an excellent conversation starter between parents and children when dealing with these sensitive issues. Wow, I laughed, I cried, I was fearful, and became peaceful. This book churned up a lot of emotions. Joy Christianson is living the perfect teenaged life. She's active in her church, has an amazing boyfiend and a great best friend. Then her life falls apart--her best friend makes a move on her boyfriend in Joy's living room. When Joy calms down she goes over to Melanie's house to talk it out. She finds Melanie has taken her own life because she couldn't face they pain that she caused Joy. She left a note to Joy. A classmate reaches out to Joy and draws her into the occult, telling her she will find the answers she needs...Joy's life changes but not for the good. The "truths" she is finding is nothing more than lies. Joy contemplates taking her own life. Her parents in desperation arranges with their pastor to get her away from her new "friends" and sent her to a Christian facility that helps teenagers come to terms with the battle going on inside of them--the battle of good verses evil. This was my favorite Diamond Estates book. It was dark, yes, and Joy had a lot of things to recover from. She lost her best friend and her boyfriend simultaneously. There are two more deaths (members of her family) in the book that tore me up. She moves, of course, to Diamond Estates and has to find her way in that new environment. She does get involved with things she both doesn't understand and knows she should shy away from. But the ending was completely beautiful. I don't want to give away too much, but this is a Christian book, so I'll state the obvious: Joy does find freedom in Christ--surpassing the half-hearted, doubtful faith she had before. She surrenders and that scene is touching. This is a story of redemption, pure and simple. I especially liked the short peek-into-her-future that the epilogue provided. I really want to spoil how God uses the dark time in Joy's life for good, but you'll just have to read it yourself! Nicole O'Dell is a very brave author to pack such depth into these books and I really admire that. I never felt like she went over-the-top. Nothing ever got sickening. But just a few scenes I wouldn't recommend reading in the dark! That said, there's a balance between good and evil/light and dark that I appreciated. Nicole O'Dell is a master at creating flawed characters and giving them heartfelt tragedies behind their actions. The Shadowed Onyx while not my favorite book in the Diamond Estates series, was enjoyable and thought provoking never the less. Joy is a girl struggling with depression after her best friend commits suicide. Along the way she gets wrapped up in the occult and has to learn to overcome her mistakes. Reading about Joy's struggles and what she went through really intrigued me. She wasn't Nicole O'Dell is a master at creating flawed characters and giving them heartfelt tragedies behind their actions. Reading about Joy's struggles and what she went through really intrigued me. She wasn't the most likeable character, but my heart went out to her. It was interesting to see how her choices effected everyone around her. But at times I felt confused with where the storyline was going and what was happening. The Shadowed Onyx was a really easy read and maybe the confusion has everything to do with the fact that exams are currently killing my brain cells, but anyhow the plot did seem a little rushed at points. Especially the ending. All in all it was a thought provoking read although not one I would allow younger girls to read due to the disturbing overall nature of the storyline. I can't wait to see what Nicole O'Dell is writing next. *I was sent an ARC copy in exchange for my honest opinions. Joy is having a tough time dealing with her best friend’s suicide. She’s looking for answers. And when some friends suggest she call on a spiritual guide, that guide appears in the form of a white wolf. At first, the wolf comforts Joy, but the longer they are together, Joy comes to learn that the wolf will not tolerate prayer to Jesus. The more Joy wants to reclaim her faith in God, the more the wolf attacks her life. Her only hope lies with the staff at Diamond Estates, but if they can’t stop t Joy is having a tough time dealing with her best friend’s suicide. She’s looking for answers. And when some friends suggest she call on a spiritual guide, that guide appears in the form of a white wolf. At first, the wolf comforts Joy, but the longer they are together, Joy comes to learn that the wolf will not tolerate prayer to Jesus. The more Joy wants to reclaim her faith in God, the more the wolf attacks her life. Her only hope lies with the staff at Diamond Estates, but if they can’t stop the wolf from having his way, who can? This was a fascinating and all-too-real look at what dabbling in the occult can do in your life. Scary. Séances and talismans opened up Joy’s heart to the occult, and she gave it too much freedom. Joy’s sorrow and depression was very realistic. She didn’t seem to know how to communicate her problems, even when she had a counselor and parents who were trying their best to help. But this was a book that was full of hope in the end. I applaud Nicole O’Dell for this amazing trilogy that shows girls the one hope that can turn their lives around. Bravo! If you haven’t read the other books in the series, be sure to check them out. This book is definitely about LOSS. Throughout the story, Joy has suffered a tremendous loss w/the loss of her best friend. She can't understand why, but her search for answers leads her down a dark road. A road that will lead her towards the world of spirits & the occult. Once she finds herself there, she finds it hard to get out. Anyone who has suffered a loss & goes searching for answers, I feel can relate to Joy. As well as sometimes finding ourselves going down a path we want to get This book is definitely about LOSS. Throughout the story, Joy has suffered a tremendous loss w/the loss of her best friend. She can't understand why, but her search for answers leads her down a dark road. A road that will lead her towards the world of spirits & the occult. Once she finds herself there, she finds it hard to get out. Anyone who has suffered a loss & goes searching for answers, I feel can relate to Joy. As well as sometimes finding ourselves going down a path we want to get off. Her journey from darkness is quite interesting. This is a definite page tuner and I plan to re-read it. This is book three in the series titled Diamond Estates. I have not read the others but will as soon as I can! This is considered a teen novel and series but even an adult will enjoy the story. There is depth to the characters and the real life situations draw you into the story. You cannot help but cheer on the young lead characters! I gave this book 5/5 stars. I liked the writing style as it was easy to read without being simplistic. I thought the characters were intriguing and really helped t This is book three in the series titled Diamond Estates. I have not read the others but will as soon as I can! This is considered a teen novel and series but even an adult will enjoy the story. There is depth to the characters and the real life situations draw you into the story. You cannot help but cheer on the young lead characters! I gave this book 5/5 stars. I liked the writing style as it was easy to read without being simplistic. I thought the characters were intriguing and really helped the story flow from one scene to the next. 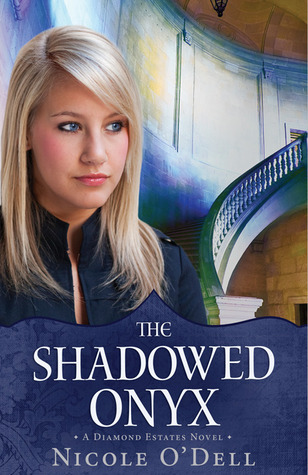 I would recommend this book to any teenager looking for a Christian fiction novel to enjoy! I would like to thank the publisher for the copy of this book I enjoyed reading. I gave an honest review based on my opinion of what I read. The Shadowed Onyx couldn't get to me at all. It was dull and dry and quite boring. And I don't see how a Christian book has to revolve around spirits and the not-quite-dead and so forth for the first half or so. And why does every book have to be wrapped around some tragedy? As if the characters couldn't possibly exist without being struck with something horrible in their lives. Anyway, I seriously can't continue reading. I understand sadness and pain and loss, but I don't understand suicide (ev The Shadowed Onyx couldn't get to me at all. It was dull and dry and quite boring. And I don't see how a Christian book has to revolve around spirits and the not-quite-dead and so forth for the first half or so. And why does every book have to be wrapped around some tragedy? As if the characters couldn't possibly exist without being struck with something horrible in their lives. I've been waiting for this final installment in the Diamond Estates series, and The Shadowed Onyx did not disappoint.As in the other books in this series, the main character faces some tough life's circumstances with an unexpected but believable response. The themes of the occult and dark spiritual activity kick up the intensity in this story. I read this book first as a stand alone as I did not have the previous book in the Diamond Estates series and then I went back and read the other 2. Wow, for those who enjoy a good YA book with some variety than I recommend this series. I gave the shadowed onyx 4 stars, it is well written and a great series for teens. Youth-culture expert, Nicole O’Dell, resides in Paxton, Illinois, with her husband and six children—the youngest of which are toddler triplets. She’s the founder of Choose NOW Ministries, dedicated to battling peer pressure and guiding teens through tough issues while helping parents encourage good decisions, and host of Choose NOW Radio: Parent Talk and Teen Talk, where “It's all about choices!” On air, O’Dell covers peer pressure, dating, purity, drugs, alcohol, modesty, popularity, and anything else that comes up along the way. Nicole writes and speaks to preteens, teenagers, and parents about how to prepare for life's tough choices. She’s author of YA fiction, including the popular Scenarios for Girls interactive fiction, which offers readers alternate endings, allowing them to decide what the main character does, and the Diamond Estates Series based on her experiences as a resident at Teen Challenge as a teenager. Her non-fiction for teens includes Girl Talk, 2/1/12, which she wrote with her two daughters based on their popular advice column. Nicole’s desire to bridge the gap between parents and teens is evident in her parenting non-fiction like the Hot Buttons , series aimed at helping parents handle tough issues with their tweens and teens before they pop up in real life. Watch for Hot Buttons books on subjects like dating, Internet activity, sexuality, prejudice, friendships, politics, and many more. For more information on Nicole O’Dell or her books, or to schedule Nicole for a speaking event or interview, visit http://www.nicoleodell.com. Podcasts of Choose NOW Radio are available at http://www.chooseNOWradio.com.